1/32: Welcome to Shifting Sands Beautiful views and steps to the beach access. Property Size 836 sq. ft. Welcome to Shifting Sands! This beautiful and beachy, ground floor unit has many upgrades and more on the way! Along with the granite counter tops, maple kitchen cabinets and higher bathroom vanities, the owners have replaced the queen bed in the guest room with 1 twin bed and a twin over full bunk. Each new bed has a 6" memory gel mattress for maximum comfort. Don't be jealous, they also added a new Comfort One Memory Gel King mattress in the master bedroom. There are also brand new 43" LG HD TV's in each bedroom and a brand new 55" LG HD TV in the living area. Also, new kitchen appliances are coming soon! This end unit offers scenic and inviting views of gulf, sand dunes, lake, and luxury beach homes. This building is closest to the pool and a short 2-minute walk through the complex to the powder soft, sugar white sands of the Gulf of Mexico. 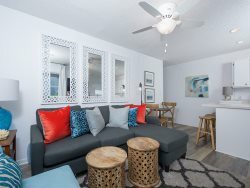 Resort Features: Beachside Villas in Seagrove Beach offers a host of amenities that will please every family. Affordable and family oriented beach vacations are there specialty in this 120 unit low-rise property. All units with fully equipped kitchens, washer/dryer, private patios and ample barbeque grills. Enjoy the two pools (one seasonally heated), 2 lighted tennis courts and 2 shuffleboard courts. Just steps away from the Emerald Coast and the Gulf of Mexico and the wonderful Eastern Lake. Beachside Villas is ideally located away from the crowds away from the ever increasingly busy traffic of highway 30A, BUT is still just a quick stroll or ride for about a half-mile from the scenic and now famous Timpoochee bike trail along 30A. For more action, Seaside is 2-3 miles west with their great restaurants and lots of shops that include wonderful art galleries and interesting clothes shops. Rosemary Beach is 7 miles east with cobblestone streets, wine and tapas bars, boutiques, and its fine dining. Seagrove Beach gives you the best of being near 30A and quiet tranquility and family times on the best Beach in the World. Please join us and enjoy. Super nice and great service. Nice place, great location, will book again! Efficient and fast to respond! Beautiful view of the beach. Fully stocked. Really clean and overall beautiful condo. Loved all the beach toys in the closet! Added value! The rental process was super easy. I really appreciated receiving a call from the owners to validate my information. The property was beautiful and just as described on the website. We love the family atmosphere and the easy access to the beach. Our only disappointment was not having the ability to rent beach chairs...but that was our fault for not booking in advance. We stayed in this complex last year and at the same time and had no problem getting chairs, so we thought this year would be the same. Lesson learned...we'll book our chairs in advance next year! We absolutely loved the condo! Very helpful. Felt secure with payment. Enjoyed the stay and we had everything we needed and wanted. Very enjoyable. We enjoyed the condo and surroundings. We'll be back. Its a great location close to seaside and lots of restaurants to eat at. The beach was close by and easy walk. Reba is always wonderful and other staff I have interacted with on phone or in email are equally friendly and responsive. Thank you again for facilitating the owner's quick response to our needs related to cookware and fixing the dishwasher! We look forward to renting in M & M at the Beach in Sugar Dunes complex next winter! The people at Myer Properties were easy to work with. I will be calling them for my next vacation. We enjoyed our stay at Shifting Sands at Beachside Villas and can't wait to return! Loved the condo and the area!